Recently a reader of RTL-SDR.com, Pavel wrote in to let us know about a new program called “Spektrum” which he has written. Spektrum runs on Windows and Linux and turns an RTL-SDR dongle into a spectrum analyzer in a similar way to rtl_power GUI front ends and RTLSDR Scanner. However one key improvement is that it is based on a version of rtl_power that has been modified by Pavel in order to make it more responsive and remove the need to wait until a full sweep is completed before you can see any results. The modified version of rtl_power can be found at https://github.com/pavels/rtl-sdr. Spektrum also has an additional “relative mode” feature. This allows Spektrum to be easily used together with a wideband noise source to measure things like filter characteristics and the VSWR of antennas. See our previous tutorial on this here, but note that in our tutorial we used Excel instead of Spektrum to do relative measurements. The Processing language was used to create Spektrum and Pavel has also released his processing library for accessing rtl_power functionality over at https://github.com/pavels/processing-rtlspektum-lib/releases. Ready to use releases of Spektrum for Windows and Linux 64-Bit OSes can be downloaded from https://github.com/pavels/spektrum/releases. Note that there may be a bug with the current release which causes only a gray window to show, but we’ve contacted the author about it and it may be fixed soon. I found something interesting on how to *fix* the dual bulk-in interface problem, I hope the Spektrum developers pay some attention on what I’ve found. 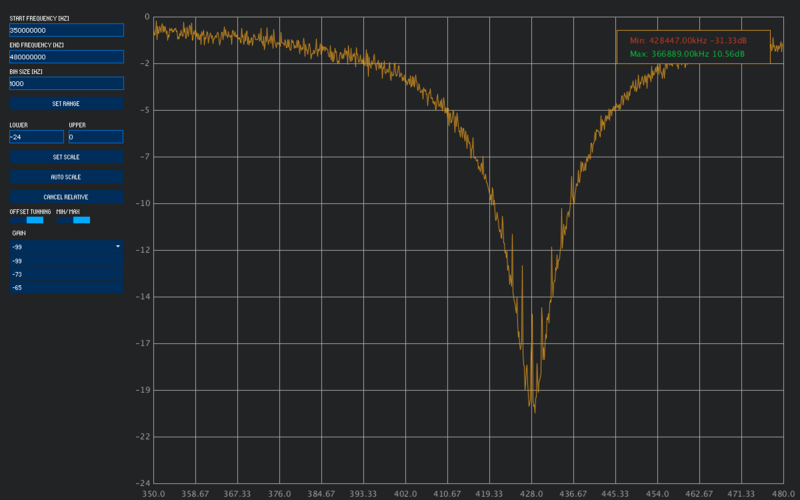 It appears that when two bulk-in interfaces are present the operating system/zadig/whatever places the rtl-sdr dongle on the second interface (bulk-in 1) instead of the first (bulk-in 0) and when spektrum tries to connect to interface 0 it hangs (gray screen). I have no deep knowledge of how spektrum works (still learning) but I found this behavior while using gnuradio. I don’t know if this is a problem with windows or zadig. Gnuradio can successfully select the correct bulk-in interface why spektrum can’t? Do you mean you discovered the problem (spektrum is trying to open the incorrect interface), or that you fixed the problem by doing something and now it works on your machine? I just want to offer some information. Now when trying to run spektrum on the new flavor I get the “Can’t open RTL-SDR Device” on both listed dongles. I reinstalled the drivers with zadig 2.4 in admin mode, same thing. On the old flavor computer spektrum works like a charm so I conclude that something with the latest windows 10 installation/upgrade is broken… as it usually happen. Funny thing is that SDR# doesn’t work either but Console 3 does work. I understand that the developer may have little time to troubleshoot this problem but out of curiosity he should try. Let me know if someone needs additional info as I have two twin win10 installations one that works and another that doesn’t. I am having trouble using the Spektrum on Windows 10. When I start the software, I get a dark blue screen with “Select Device” menu on the left hand side and also shows list of two (?) RTL devices as against mine only one connected as Generic RTL2832U OEM. But when I click to any one of this, it gives and error as “Can’t open RTL-SDR Device” and when I click on “OK” the software simply shuts down. Can you please guide me to sort out this problem? Same here Windows 10 updates broke something. I have it running fine in an original installation of windows 10. I upgraded my computer to a SSD and reinstalled windows 10 (latest media creation tool) same computer, same hardware, the only change is a new SSD and it fails as you described… two bulk interfaces and on both it fails to “open device”. So every time I want to use spektrum I have to swap hard drives. that said not many do..
Where is a good place to figure out how all of the firmware and software work together for RTL-SDR? I’m not too familar with visual C++, but somewhat with C++. Also what is better Ubuntu windows 8 or Slackware? for running the SDR software? So far all I get is noise, and it changes some in pitch with various settings on HDSDR. I figure that I need it running before getting this to work. Does not work on win10 x64, gray window in all compatibility modes. Author should be ashamed for releasing such a bummer. And you are telling me that 3 years are not enough for fixing that? LoOk At mE, I aM a PrOgRaMmEr tOo! Ok, after some goofying around I managed to run Spektrum – but only the v1.02 release! What did not help was: reinstalling Visual C++ Redistributable for Visual Studio 2012 (I’ve even uninstaled it for a test, and Spektrum 1.02 runs without it); updating RTLSDR (RTL2832U) drivers (they were ok. nontheless, dongle worked with SDR# formerly); also running differen releases in a diferent compatybility mode did not make it. What has actually helped was moving main folder to a desktop, located on a system partition and running it with RTLSDR plugged in. Anyhow, flawless release would be much more appreciated. Sorry I’ve got irritated. The project is opensource, so you could write a patch to fix exactly what you see as being wrong. Instead of just complaining. How much have YOU contributed to the community? Other than rudeness and world record level ingratitude? You act like a very spoiled child. Pavel, Thank you so much for the work you have done. I am looking forward to working with your code. As for your critic, please forgive him, it is apparently past his nap time. Does not work, grey screen, delete this fake spectrum analyser. Not to be rude but why do people keep calling these things spectrum analyzers? This isn’t a spectrum analyzer, Without the ability to actually analyze the RF signal It becomes nothing more than a simple band scope. In order for it to be classified as a spectrum analyzer, at the very minimum, it would need at least 2 markers with peak averaging or peak hold which could then automatically calculate and display the difference in dbc between to signals. Preferably it should also have a means of normalizing the display. This would then give you the ability to use something like a wideband noise generator to simulate a tracking generator. This would then give you the ability to sweep filters and measure their frequency response. I’m not sure how hard it would be to add those tools but doing so would transform this from a mere novelty toy into a really useful RF lab tool. Because they are spectrum analyzers. Spectrum analyzers are generally defined as “An instrument primarily used to display power distribution of an incoming signal as a function of frequency”. Period. If you need a particular set of features, then you define your requirements and purchase the appropriate spectrum analyzer with the appropriate add-ons or build it yourself. is there a possibility of a “until manually reset” max hold? this would be a great tool to monitor a portion of spectrum over a period of time. A great application, but we need a 32bit windows version built and released please! Could somebody build a 32bit Ubuntu version? I can’t seem to get all the files. My testing laptop is 32 bit. I am not taking my new one out in the wild. If not build, at least help me build one. Would love to have something like this for mac. Would love to have something like this on mac and not require a programmer to install. Hi… it could work under 30 Mhz ? It works ! You need to install Visual C++ Redistributable for Visual Studio 2012: vcredist_x64.exe to work. 12/2 and still a gray screen for me with various RTL’s plugged in. Using eartoearoak.com/software/rtlsdr-scanner. Guys, if you’re getting a plain gray screen are you sure you’ve plugged in an rtl-sdr dongle ahead of time? I get the gray screen but only if I don’t have a dongle plugged in and ready for the software to connect to. If one is plugged in it works great. This is so much faster than doing spreadsheet stuff by hand. I can interactively tune antenna and filters now! grey screen for me as well! Same, grey box on Win 7 x64. If the software doesn’t work, I don’t understand why you’d make a post about it and link to it. I’ve got a gray screen too! Windows 10 64 Java 8.60 .